By the year 900 Krakow was already a vibrant trading town, however the real boost to the development and expansion of the modern city started in 1038 when Krakow became the place of residence of royal dynasty of Piasts. Farther development of the city was accelerated by the charter of the city rights given to Krakow by Polish prince Boleslaw Bashful in 1257. Location according to the Magdeburg Rights initiated the formidable transformation of a medieval settlement into one of the most powerful and modern city in this part of the Europe. An enormous square was demarcated at the center of the town – the largest of this kind in the Medieval Europe. This is today’s Market Square – still impressing visitors with its enormous area and surrounding historical buildings including the famous Cloth Hall. 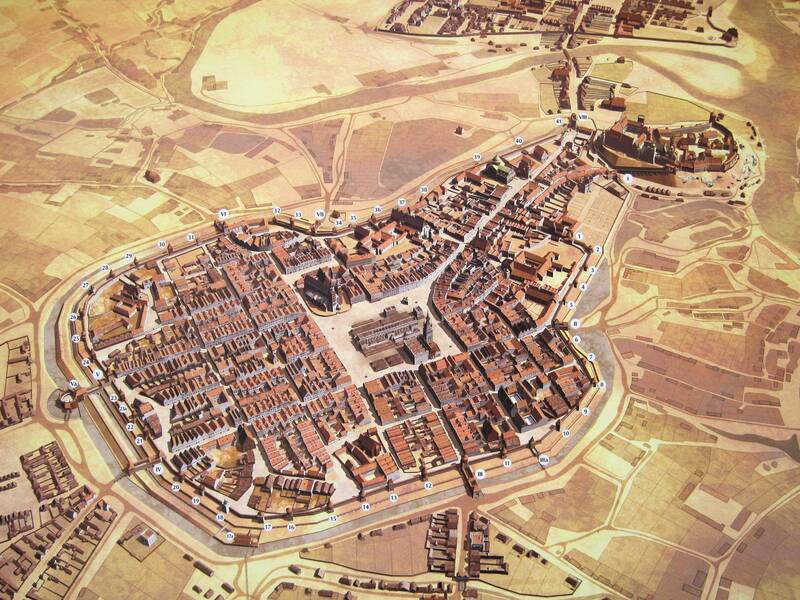 This picture shows the plan of the old town of Krakow at about 1650. In the center of the town - the Market Square with the Cloth Hall, City Hall and the Church of St. Mary. Clearly visible Royal Tract leads to the Wawel Castle on the top-right. Existing today fragment of the defensive system includes Joiners Tower (#23), Furriers Tower with the Florian Gate (V), Barbakan (Va) and Haberdashers tower (#24) – all on the left. On the top of the picture the Jewish town of Kazimierz (named after Polish king Kazimierz the Great who offered this area for Jewish settles in XIV century). Soon after, the first fortifications were erected, initially wooden-earthen type surrounded by a moat. In the subsequent stage of strengthening and extending the defensive system, the wooden walls were replaced by the stone and brick ones. The powerful towers with entry-gates were build in the strategic places and connected with 9.5 meters high and up to 2.5 meters thick walls. As the result, in the beginning of 14th century the whole located city of Krakow was protected by the impressive stone walls. Finally, during the reign of the Kazimierz the Great (1333-1370) the walls were extended encompassing the Wawel Hill with its Royal Castle. As a result the Cracow achieved a unified defensive system. The advance of siege techniques forced Krakow to upgrade its defensive system. During the 15th-17th centuries the walls were reinforced with brick towers. 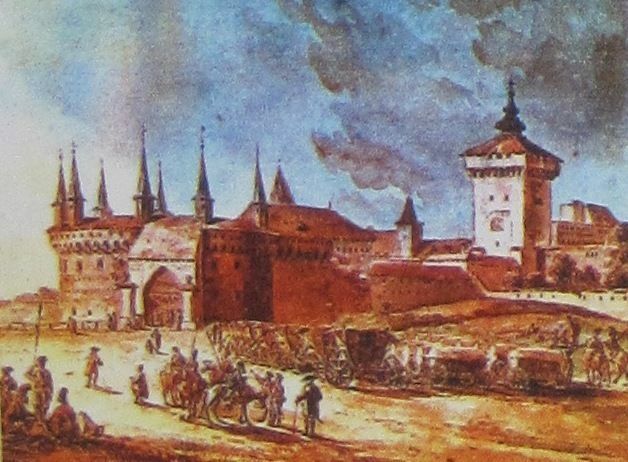 In 1473 there were 17 towers including gates, hundred years later the defensive system counted 33 towers and in 1684 at the peak Krakow’s power – their number reached 47. The city gates were also reinforced by adding to them so-called necks. The most impressive one – called Barbakan was connected to the northern gate of St. Florian. The Barbakan – a pearl of Cracovian defensive architecture was erected in 1498-1499 in a Gothic style. It is a brick-stone structure with 24.4m of internal diameter and walls ranging from 1.5m to 3.65m thickness. It has four tiers of loopholes and numerous turrets forming an excellent observation and defensive stronghold. The Barbakan was surrounded by a 26m wide and 6m deep moat spanned by the partial draw-bridge. The Barbakan stronghold made up the northern part of the defensive system – the most exposed to the enemy attacks. 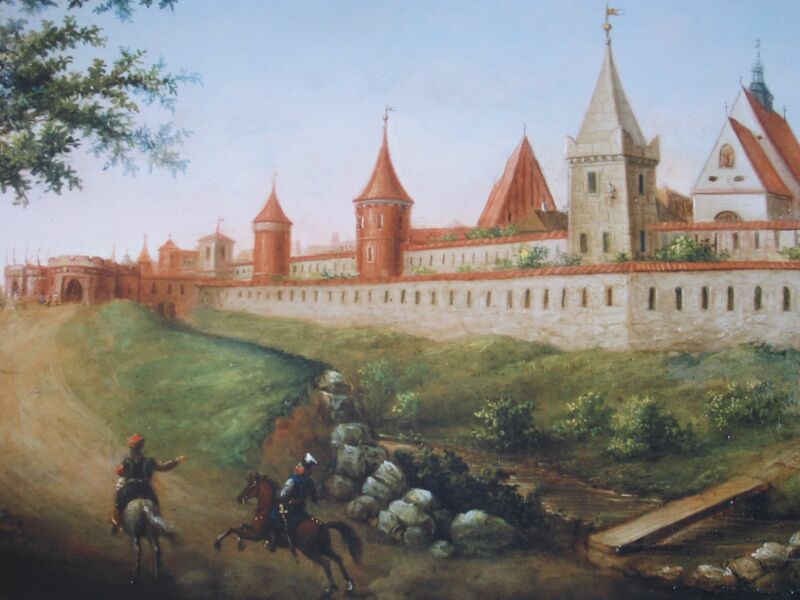 The southern part of the city was well defended by the Wawel Castle and the Vistula river, the eastern and western flanks were difficult for attackers due to the large swamps and ponds. The important elements of the fortification system were gates guarding the access to the city. From the inside, they were closed with mighty oak gates, and from the outside by a portcullis lowered on chains. The gaits were closing at dusk and opening morning at the signal from the tower of St. Mary’s Church from where (as the highest point in the city) the area well beyond the walls was observed by city guards. At the sign of danger, bells from the tower were summoning the Krakowians to the defense. The duty to defend the city rested with (among others) the craftsmen of the Krakow guilds (which gave rise to the towers’ names). Since the 13th century the training was provided by the paramilitary organization subject to the city authority – called Brotherhood of the Rooster. View on the city of Krakow from the north (as shown in the 1493 Hartman Schedel's Chronicle). On the left side of the picture the Jewish Town of Kazimierz (Casmirus), on the right – the town of Krakow (Cracovia) (from the collection of the Historical Museum of the City of Krakow). The Jews had a considerable share in Krakow’s development. They have been freely admitted to Krakow from the Middle Ages settling in their own quarter – Kazimierz (this was the largest Jewish community in Europe till WWII). During centuries the Krakow’s walls well defended the Royal City against the enemy invasions – be it archduke Maximilian Habsburg in 1587 or Swedish king Carl Gustav (during so-called Swedish deluge” of 1655) and then in 1722 the Russian army. Besides the defensive functions over the centuries the Barbakan also carried out the representative role for it was the most significant and noblest entrance gate to the capital city. Here the famous polish “Via Regia” (The Royal Road) starts. Kings elects, their wives and the entourage traveled this tract to the Wawel Hill for the coronation in the Royal Cathedral. It also carried to the city envoys, legates, triumphant commanders (Polish king Jan II Sobieski after his victorious battle of Vienna in 1683). Later poets and national heroes replaced the kings. For example here started the funeral procession for the Tadeusz Kosciuszko in 1818, or the poet Tadeusz Slowacki in 1927. In early 19th century the huge advance in siege techniques and firearms made defensive walls obsolete. The major part of walls, gates and towers was gradually demolished. Thanks to the effort of Jagiellonian University professor and conservator Feliks Radwanski, the most representative northern part of the defensive system including Haberdashers’, Joiners’’ and Carpenters’ Towers as well as St. Florian Gate and Barbakan was saved and preserved for future generations as an architectural witness to Krakow’s might and glory. Free Castles Pictures - Krakow: Old city - Barbakan's defensive system. Free Castles Pictures - Krakow: Old city - Barbakan. On the right a view from the Barbakan on the Matejko Plaza with the monument commemorating the Polish victory in the battle of Grunwald in 1410 (one of the biggest Middle-Age battles in Europe). Free Castles Pictures - Krakow: Old city defensive system. Left- inside of the Barbakan, Right- inside of the Haberdashers' Tower. Shortly after demolition (years 1822) the area around the old city was cleared from debris and a work begun to create vast gardens encircling the old city. Till today these gardens called Planty bring the beauty and peace of green acres with all kind of trees, colorful flowers and numerous ponds to those longing for the moment of rest after visiting the old town. Hopefully, this short virtual tour of the Medieval Krakow can open in front of you at least partially the past glory of this old city. For more and deeper impressions – you are invited to follow the subsequent pages of Krakow in free pictures. At the end for those eager to live it on their own - welcome to Krakow – one of the pearls in this part of Europe. Ojcow castle built in the Renaissance style offers not only a beautiful architecture and richly decorated interior (national museum), but also the tasty food and great views on the park from the castle's restaurant.